This website is dedicated to all those art medals, which are hidden in safes or safe deposit boxes - although of no great monetary value. May at least their images delight some of the visitors of this website. Here you can see art medals and plaques - many of them are art nouveau and art deco - from different countries. Bogomil Nikolov, Emil Bachiyski (Bulgaria), Jiri Vlach, Milada Othova, Michal Vitanovsky (Czech. Rep.), Victor Huster (Germany), Ron Dutton (Great Britain), Elisabeth Koster (G.B. ), Laszlo Szlavics, Laszlo Szunyogh (Hungary), Janis Strupulis (Latvia), Algirdas Bosas , Romualdas Incirauskas (Lithuania), Carla Klein (Netherl. ), Ewa Olszewska-Borys, Pawel Leski (Poland), Jose Teixeira (Port. ), Georgiy Postnikov (Russia). A completeness in any sense, concerning for instance all the medal artists of a certain country or the art medals made by a certain medal artist is not intended. The webmasters aim is that you enjoy the pictures of the art medals presented here and that you become interested in the subject of the medaillic art. 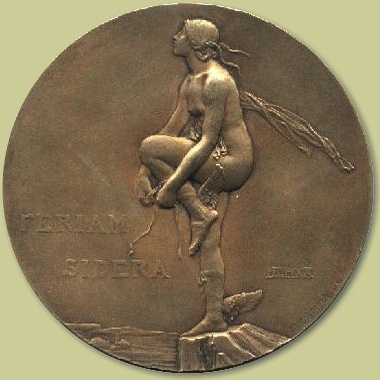 For more information - for instance for the history of the art medal - look at the numerous links of this art medal website. Although art medals are made since about 500 years, this website contains only medals since about the year 1870, reflecting mainly the taste of the webmaster of this site - besides the economical reasons of course. This art medal website is noncommercial.